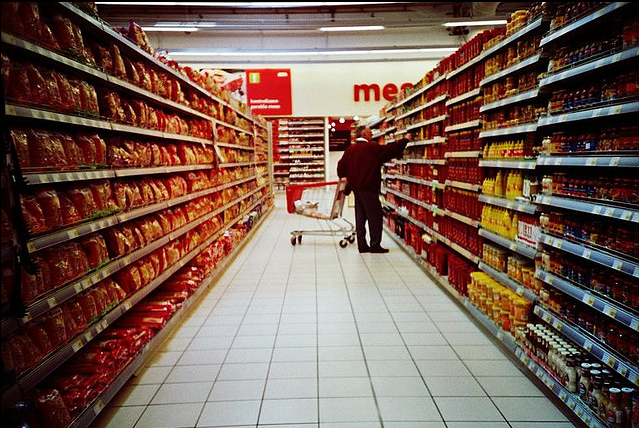 Grocery shopping is one of the many ways we vote with our money. In buying our ingredients for the weekly feed, we are choosing the products we want to support. Making the effort to shop ethically doesn’t have to be hard – here are ten things to consider when grocery shopping. Make a shopping list so you don’t forget anything you need to buy. You’ll also have an easier time avoiding impulse buys, such as sale products that you don’t really need. Double check you’ve got re-useable shopping bags with you (and don’t leave them in the boot!) You could even fill one of these re-usable shopping bags with any old plastic bags you have lying around (including checkout bags, veggie bags and processed food bags like bread bags). Many supermarkets have plastic-bag recycling facilities for soft plastics that can’t be disposed of in your local council recycling pickup. Have a snack and a glass of water before you go. Shopping when hungry or thirsty is always a bad idea – you’re far more likely to splurge on an individually packaged snack or a bottle of water. Look for products with minimal packaging, and where possible, with minimal plastic wrapping. Many products are packaged in cardboard made from recycles sources – consider these ahead of those wrapped in plastic. Also avoid products which package single-serves individually. Some shops sell items in bulk without packaging. Look out for a co-op or business near you that makes an effort to avoid unnecessary packaging. Buying local supports local businesses and invests in the community. Shop Ethical explain what “Made in Australia” labelling means, and give some tips on how to best shop locally. Shopping at farmers markets is one good way to find local produce. If you are shopping at a supermarket, keep in mind that “Product of Australia” means the ingredients are Australian-grown and the product was manufactured here, while “Made in Australia” means the item was assembled here but up to 50% of it’s ingredients may be from overseas. Buying local will also reduce food miles, but is usually not the best answer to address your carbon footprint in and of itself. If your motivation for eating more local food is carbon emissions, then it is better to try to eat seasonal local food. Food miles should not necessarily be your primary focus when it comes to food emissions, as they are not nearly as important as what you eat or what you waste. Will you really get through those two bags of carrots? Don’t be tricked by two-for-one specials on perishable ingredients unless you have a plan to put all of it to good use. While it’s always exciting to grab yourself a bargain, have a think about whether the extras are just going to end up in the bin. Removing two for one deals on perishables such as salad is one way that UK supermarket chain Tesco plans to reduce its own food waste. It’s becoming easier to find products with Fairtrade certifications in the grocery store – chocolates and coffee are the most obvious products. Fairtrade certified products should be adorned with this label. Keep in mind that some companies that have good labour standards may for one reason or another not complete a certification process. If you’re concerned about your favourite brand, you could do a little research into their practices (start with their sustainability or corporate responsibility report on their website; explore further or move to a new product if they don’t give concrete answers to your questions). For info on why fair trade is important, check out this infographic. Understanding the different types of certifications on the meat and eggs available can be complicated. Luckily, Make It Possible have created easy-to-understand guides to understanding Australian labels for chicken eggs, chicken meat, pork and ham and even turkey meat. By checking what different certifications mean, you can choose which accreditations meet the ethical requirements you have for your animal products. 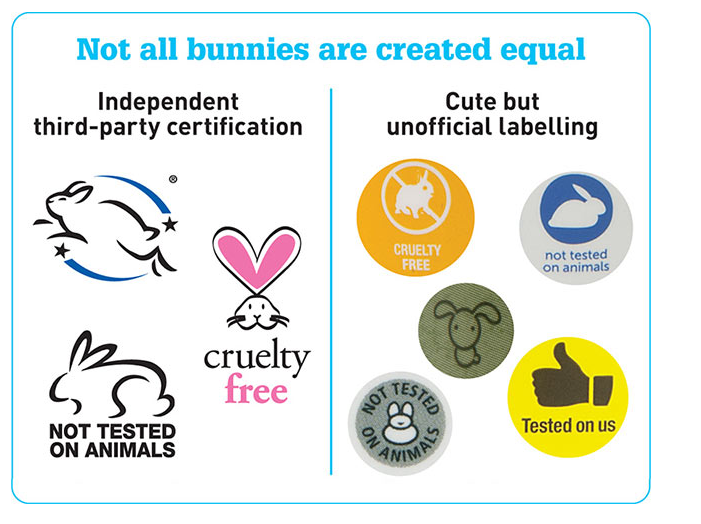 If you’re buying cosmetics, shampoos, soaps or other personal products that may be tested on animals, have a look for one of these CHOICE endorsed certification labels. Choose Cruelty Free have a list of accredited brands and what their products contain for vegetarians and vegans, as well as information about animal testing and what their certification means. For reviews and recommendations on cruelty free personal care products, check out this Otter article by Lisa Edney. Unregulated palm oil production destroys forests, threatening local species and contributing to global warming. Palm oil is in all kinds of products including packaged, processed foods and cosmetics. To find out which brands are pumped with palm oil, and to find more sustainable alternatives for your shopping list, have a look at the WWF palm oil buyers scorecard. One difficulty with identifying palm-oil free products on the supermarket shelf is that palm oil is often disguised under a different name. Melbourne Zoo has published this small card that you can print off and keep in your wallet to de-code ingredients, and find sneakily labelled palm oil, while you are at the supermarket. We use toilet paper every day, but it’s something we rarely think about unless disaster strikes and we find ourselves with naught but an empty roll. For most people there is really no longer any reason not to insist on fully post consumer recycled loo paper, with quality concerns now addressed and often not much of a price difference. Down To Earth Mother has some good tips on how to buy eco-friendly toilet paper – what to look for on the label and what it means. Another way to go could be to support a social enterprise – Who Gives A Crap are Australian, donate 50% of their profits to Water Aid, and use 100% post consumer waste recycled fibre. Cleaning products can have a number of side effects – not just for us, but for the environment. Buying safe cleaning products isn’t hard, and this Otter article has some tips on understanding product labels and choosing products you’re sure are safe. Look out for products that are bio-degradable, and are in recycled and/or recyclable packaging.